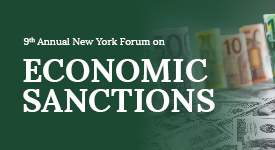 NEW YORK - Oct. 25, 2018 - PRLog -- American Conference Institute (ACI) will host a two-day country specific analysis on the most pressing issues affecting financial services and global exporters on RUSSIA, IRAN, NORTH KOREA, and VENEZUELA economic sanctions. Hear Compliance Best Practices from Senior In-House Speakers from: American Express, AllianceBernstein, Baker Hughes-GE, Barclays, BNP Paribas, Charles Schwab, Citibank, Deutsche Bank, Fidelity Investments, GE, Goldman Sachs, Morgan Stanley, MUFG, Société Générale, Standard Chartered Bank, TechnipFML, UBS, Visa, and more. Staffed by industry specialists, lawyers and other professionals, American Conference Institute operates as a think tank, monitoring trends and developments in all major industry sectors, the law, and public policy, with a view to providing information on the leading edge. Headquartered in New York, ACI has grown to produce more than 100 events each year, attended by thousands of senior delegates from across the world.